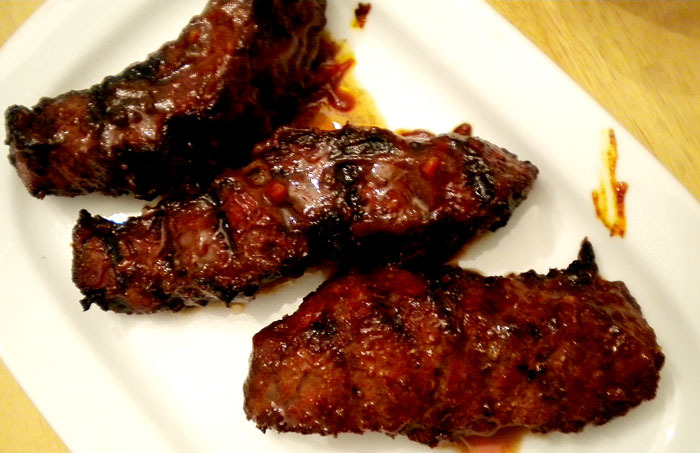 BBQ short ribs, cold sesame noodles, grilled veggies, and banana sundaes- recipes included. 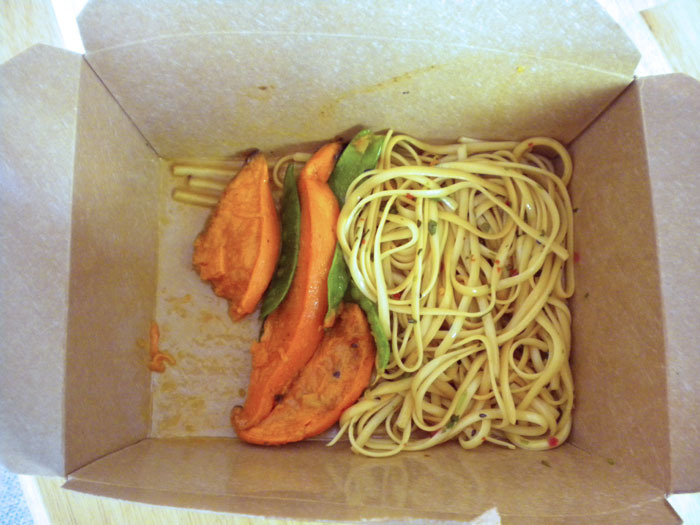 Sometimes I like to try new things at the Whole Foods prepared counter. I like to see if they’re good, then find a recipe for them to may myself- they have a lot of recipes for their prepared stuff on their website. Last week I tried these cold sesame noodles which were really good. I couldn’t find the exact recipe so I modified this one which was similar, and to use stuff I already had in the house and to still be able to make it like the one from the store. Mix the vinegar, soy sauce, sesame oil, chili paste, cilantro, garlic, and brown sugar in a small bowl to make the dressing. Cooke the noodles according to package directions, be sure not to overcook! Once they’re cooked drain the noodles and run them under cold water right away. 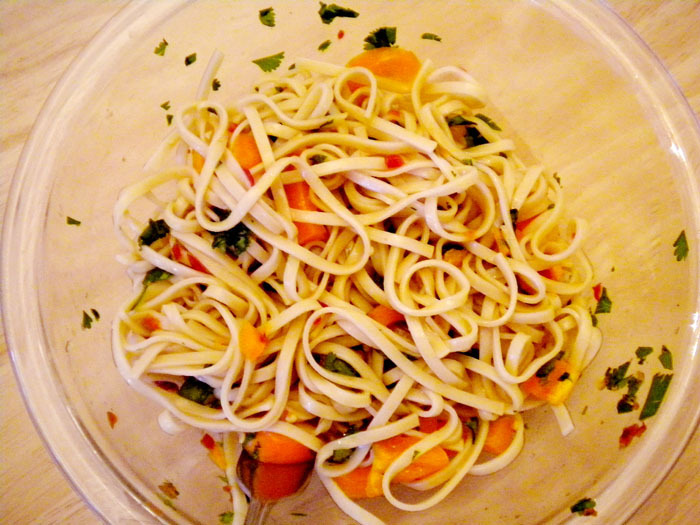 In a larger bowl, gently toss the noodles, dressing, and bell pepper together. it should be pretty cold because you cooled off the noodles when you rinsed them but you can chill it further or for sure put it in the fridge if you aren’t going to eat it right away. I think it was really good and DM really liked it, too. We had it with grilled/BBQed boneless beef short ribs. We finally wanted to fire up the grill! I hadn’t used it in awhile and wasn’t sure how it would behave and didn’t want to accidentally waste an expensive cut of meat. You’re not really supposed to be able to grill short ribs but the ones I got looked pretty good and like they’d work. So I found this recipe and did it. I didn’t use their BBQ sauce recipe, I got one from The Joy Of Cooking instead. I imagine it would work with just about any BBQ sauce. I was very careful to watch them and keep testing them with the instant read thermometer. They came out really good, I was pretty happy. Dange was too. Grilled boneless beef short ribs. 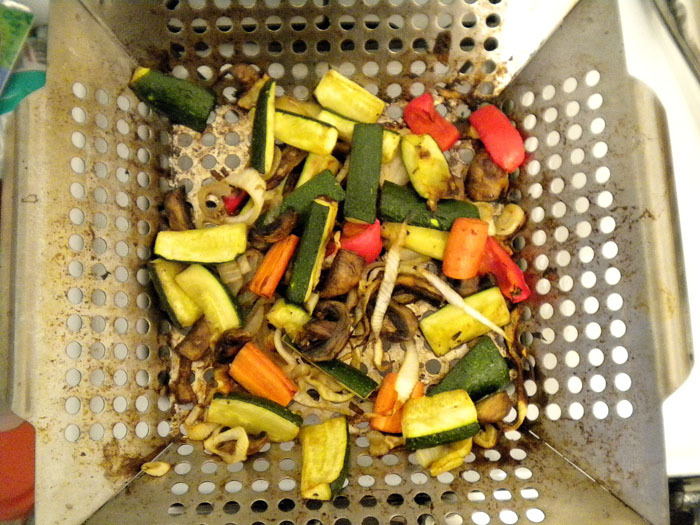 And grilled mixed veggies. Just some olive oil, salt, and pepper and onto the grill they want. I like them pretty soft so it took about 45 minutes. Then later we had this simple dessert. 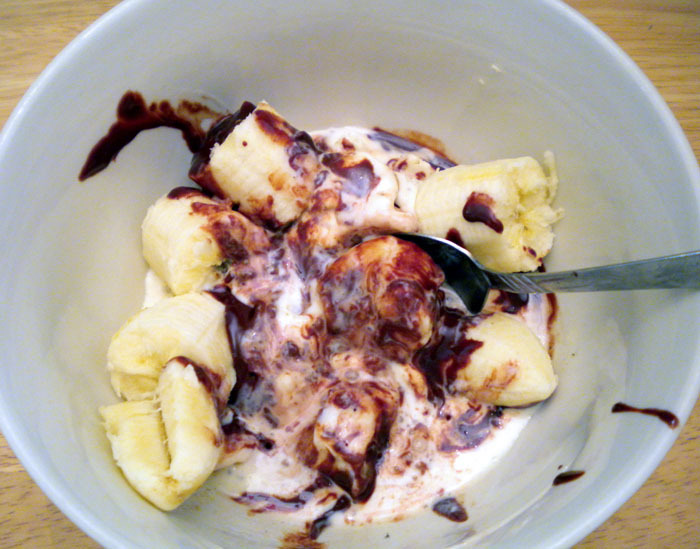 I melted some chocolate chips with some half and half to make a sauce, then drizzled it over vanilla ice cream and bananas. Really good!